Ok, ok. I know it, we are addicted to two ingredient fudge. We can't help it. It is easy, and sweet and so customizable! Of course another holiday called for another batch. MiMi was going to try to resist... but she couldn't. She had to do it, and I think we can all agree we are glad she did! Isn't it cute? See, I told you, cute! There are so many fun things to make and we have had a lot of fudge lately, so she didn't want to make too much. This is one batch, split into three and colored and then poured into a 4x6 glass dish. She thinks it would be even more fun if you did three full batches in a 9x9 pan. Mimi thought it would be fun to try both food coloring and food gel to see if there would be any difference in texture. She used food coloring for the green and gel for the yellow and purple. The texture was not affected, but as you can see the gel produced much more brilliant colors. Feel free to use whatever you have on hand! Divide fudge into three bowls and color each one. The gel is pretty concentrated so, start with just a drop or two and keep going until you get a shade you like. Pour into a greased glass dish (mom used a 4x6). Working quickly, add each layer. You want them to still be warm enough that they will meld together. If it starts getting too thick, pop it back in the microwave for a few seconds. 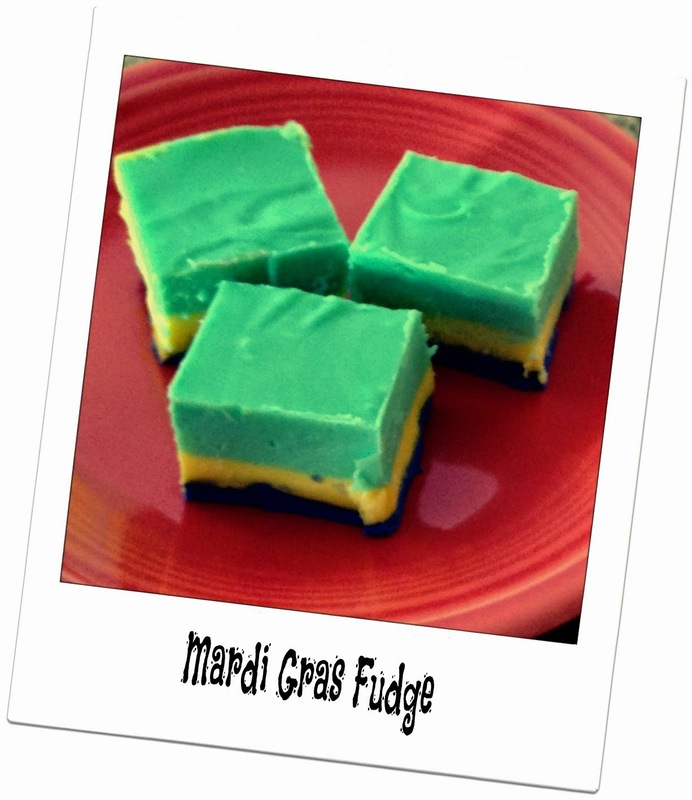 This Mardi Gras fudge was fun to try. 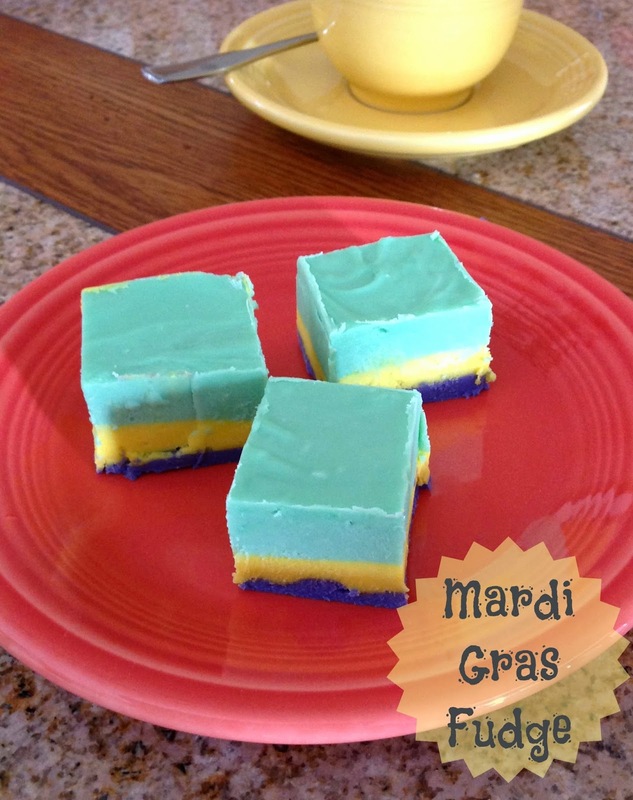 You can use liquid food coloring if you would like. Wait until you see what I have planned for St. Patrick's Day fudge. I'm pretty excited about that one too. This looks scrumptious, but I was wondering if I have to eat it with beads on? It would certainly make it more festive!